ATN NVBNB05X3A NVB5X-3A Night Vision Binocular FREE SHIPPING! The ATN NVB5X-3A Night Vision Binocular offers long-range, low-light visibility. Its weather-proof and fog-proof casing also make it suitable for all-weather conditions, guaranteeing an excellent option for law enforcement or outdoor field use. The binoculars come with a powerful, high-resolution, third generation intensifier tube and multi-coated all-glass optics, ensuring crystal clarity and image sharpness. It features automatic brightness adjustment and bright light cut-off technology to protect the tube and provide a consistent image. Precise digital controls allow for on-the-fly adjustments with impressive accuracy. The tube is backed up by a powerful infrared illuminator, allowing operatives to maintain visibility even when ambient light is lacking. The infrared and low battery indicators are located inside the viewfinder for constant status checks while observing targets, ensuring nothing is missed. 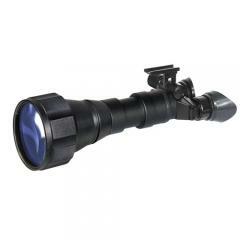 ©2002-2019 CopsPlus.com: ATN NVBNB05X3A NVB5X-3A Night Vision Binocular FREE SHIPPING!